This story was updated at 12:45 p.m. ET. HOUSTON – Astronauts on the shuttle Discovery have a busy day of unpacking ahead as they dig into a big delivery job at the International Space Station. But first, they got a chance to catch up on their sleep. Discovery arrived at the space station yesterday (Feb. 26) to kick off a weeklong stay at the orbiting laboratory. But their entry into the space station was delayed, pushing them behind schedule for another chore: installing a big spare parts platform they'll use later in their mission. 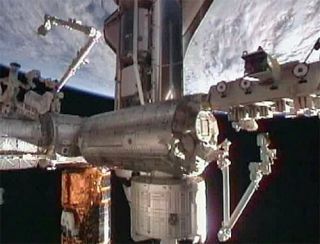 So the six shuttle astronauts and six station crewmembers opted to work late to finish the complex robotic arm operations needed to move the cargo platform from Discovery's cargo bay to a point the station's backbone-like truss where astronauts can reach it during the mission's two spacewalks. "The crew elected to stay up about an hour and a half or so late into their work day to finish up," said NASA's flight director David Korth during a briefing today. "We let the crew sleep in this morning, 30 minutes or so, to make up for the time spent last night to get that accomplished." The astronauts were roused from their slumber at 7:23 a.m. EST (1223 GMT) this morning. Discovery is delivering supplies, spare parts, an extra storage module and a dextrous humanoid robot assistant named Robonaut 2 to the space station. Meanwhile, engineers on the ground are evaluating 302 photos of Discovery's backside taken by astronauts onboard the station before the orbiter docked yesterday. The photos show high-resolution imagery of the shuttle's heat shield tiles that must be analyzed to make sure the tiles didn't sustain damage from falling debris during Discovery's liftoff. The images are still being studied, but mission managers think the heat shield is in good shape and no further inspection will be needed. "Everything is going really well with the orbiter," Korth said. "The orbiter crew is doing well. From a station side, all things are nominal." Today, Discovery's six shuttle astronauts and the station's own six-person crew will spend most of their time transferring cargo and supplies from the shuttle to the orbiting laboratory. The day's chores will primarily consist of unpacking, moving, and allowing the crew time to get situated on the station, shuttle flight director Bryan Lunney told reporters yesterday. Two of the spaceflyers, mission specialists Steve Bowen and Alvin Drew, will also spend part of today reviewing procedures for their first of two spacewalks on Monday (Feb. 28). Bowen was a late-addition to Discovery's crew. He replaced astronaut Tim Kopra as the mission's chief spacewalker following a bicycle accident that sidelined Kopra. Discovery's 11-day mission, the STS-133 spaceflight, is Discovery's final flight before NASA retires its space shuttle program later this year. Only two other shuttle flights remain after this one, so NASA wants to load the space station up with as many spare parts as possible to prepare it for its looming life without the shuttle fleet's support.